Carbon treble strings are notorious for intonation issues, usually because the diameter varies so much over the length of the string. To solve this problem, we reformulated our GPX™ Carbon Treble classical guitar strings for unsurpassed diameter accuracy. 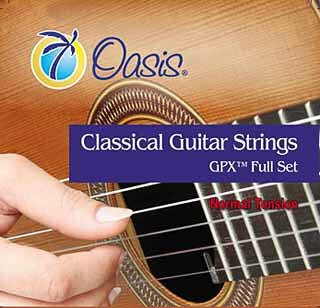 Laser micrometer technology ensures that Oasis® only packages “true” strings, enabling your guitar to play in tune from the first fret through the higher positions. Ever since we introduced our original GPX™ high tension strings, we’ve heard that some customers, "love the tone, but would prefer lower tension strings." They inspired us to develop a set of normal tension strings. We’ve been sampling these strings through the Delcamp Classical Guitar Forum since early February 2009. The response has been overwhelmingly positive! *Carbon trebles aren’t just your typical carbon fiber. They are made of pvdf (polyvinylidene fluoride), a thermoplastic fluoropolymer with 80% greater density than nylon. This allows for a thinner string to have the same mass as nylon for a given string tension.